The Bear Creek Saloon and Restaurant is located in Bear Creek Montana. A historical mining town near Beartooth Pass. An award winning steakhouse for several years in a row for 'Taste of Red Lodge.' 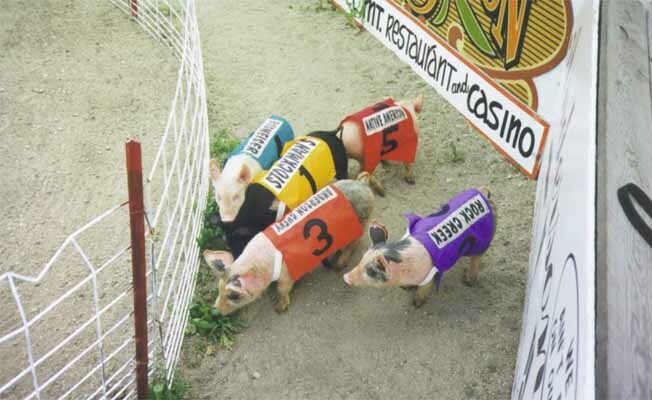 During the summer season (Memorial Day through Labor Day) pig races are held Thursday, Friday, Saturday and Sunday at 7:00 p.m. There are 12 nightly races on a 15 minute schedule featuring such stars as Makin' Bacon, Knuckles and Nota Hot Dog. The winning pig pays out one-half of each $50 race pot. The other half goes toward scholarships for Carbon County high school students. A white wire fence borders the mini oval stadium complete with ads on the walls, which is located outside the back of the restaurant. From a balcony fans witness the moves of their favorite pig. These pigs can fly! How? Drop by the races, stay awhile and learn the secret. And to satisfy that human urge to eat, bite into a variety of 100% Montana beef steaks or opt for Cajun shrimp and grilled chicken. Looking for a pork chop? Don't even go there. These 20- to 90- pound racers are well cared for and adored! Ready to pig out? Give the Bear Creek Saloon a call.